Thousands of Australians will soon take action to improve global access to clean water and basic sanitation by fundraising for Caritas Australia’s annual Project Compassion appeal. “The Caritas philosophy is to help marginalised communities become the architects of their own future and Project Compassion has enabled us to achieve major change over 54 years,” said Caritas Australia’s chief, Paul O’Callaghan. The annual Lenten campaign begins on Ash Wednesday, March 6. A special focus during this year’s appeal will be on the consequences and the response of Caritas Australia to the current global water crisis. “According to the United Nations, each year, more people die, the majority aged under five, from diseases caused by dirty water than from all forms of violence, including war. A lack of clean water disrupts the education of girls and robs communities of income and food,” Mr O’Callaghan said. Project Compassion’s 2019 theme is “Hope”, and it centres on six stories that profile Caritas’ life-changing development work in communities across the globe. The stories come from Zimbabwe, Indonesia, the Solomon Islands, Australia, Bangladesh and Vietnam. Caritas has come up with a number of creative ways supporters can fundraise for Project Compassion. For example, if you are giving up coffee, chocolate or something else as a Lenten sacrifice this year, you can direct the money you would have spent on those goods to the Project Compassion campaign. On “Fish Fridays”, supporters may wish to reflect on those who are less fortunate by eating a meal that replicates the meagre diet typical of people living in many small communities, often little more than a sliver of fish and a cupful of rice. 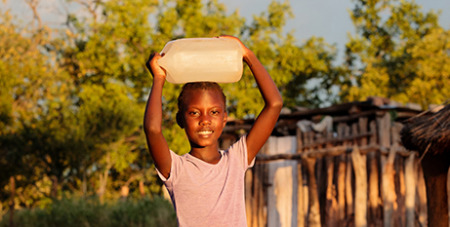 Schools or groups are encouraged to participate in the Caritas Ks Water Relay, which reflects the distances some people in developing countries have to walk to reach water sources.